If you’re constantly trying to convince yourself “a job is a job,” get ready to open your eyes. In You Deserve to Love Your Job, careers blogger and entrepreneur Alexis Grant explains why you shouldn’t settle for a job that makes you hate Mondays, and how to navigate the new digital world of work to set yourself up for a fulfilling career. This book features many of Grant’s signature ideas about Scheming and Leaping and creating your own job, offering a blueprint so you feel excited about your professional life and ready to take action. You’ll learn how the old rules of work are holding you back, the best ways to invest in yourself (rather than your employer), and how to use a job you don’t like as a stepping stone toward something better. Once you explore these Big Ideas, you’ll understand why there’s absolutely no reason for you not to love your job. It’s time to think differently about your career. Are you ready? This mindset, however, revolves around what I like to call the “old rules” of the workplace. If you’re following these rules, they’re holding you back. They’re holding you back BIG-TIME. This old-school mindset keeps you from using the new digital world we live in — where anyone can make a name for themselves online, share their expertise and show their value — to your advantage. It keeps you from discovering what you deserve: a job you actually enjoy. This mindset has GOT TO CHANGE. It needs to change both for individuals and for society at large. 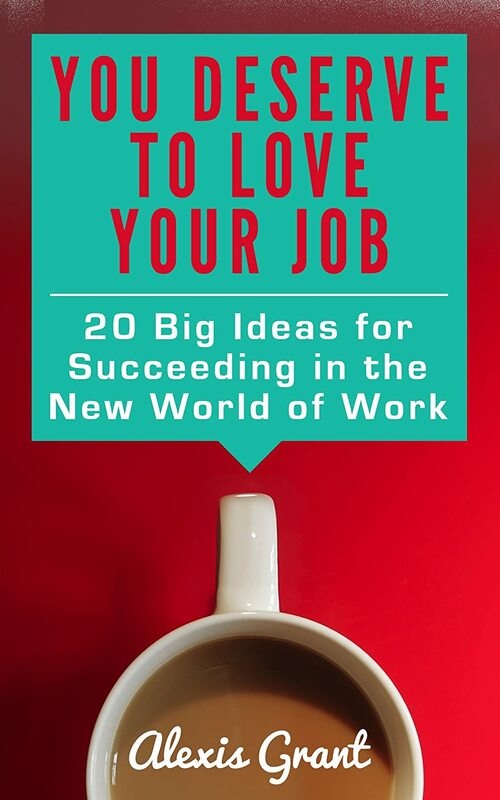 That’s why I wrote You Deserve to Love Your Job: 20 Big Ideas for Succeeding in the New World of Work. Alexis Grant is an entrepreneurial writer and digital strategist with a focus on careers and the new world of work. Until mid-2011, she worked as a journalist, first for the Houston Chronicle, then for U.S. News & World Report. Now she runs her own business, creating and selling digital guides and courses on her website and helping small businesses with blogging and social media. She’s also managing editor of Brazen Careerist’s blog and The Write Life. Alexis was named one of Problogger’s 20 Bloggers to Watch in 2012, and she blogs at http://alexisgrant.com. If you have read this book scroll down past the book sample and tell us what you thought about the book!